An emerging theorem on stationary populations can determine the age distribution of a population by predicting how much longer they have to live – a finding with implications ranging from infectious-disease control to elder care. “If you understand the age structure of the population, you can better understand the risks and needs,” said Dr. Arni S.R Srinivasa Rao, an MCG mathematical modeler working with Dr. James R. Carey, an entomologist at the University of California, Davis. “If there are more children, you need to worry about schools; if there are more older people, you need to worry about health benefits.” The theorem has been published in the Journal of Mathematical Biology and Notices of the American Mathematical Society. The work began when Carey deduced that by studying a large fruit fly population in captivity, he could determine the age structure of the general fruit fly population. It’s called Carey’s Equality. Figuring that out without knowing the age of the fruit flies at capture was Carey’s eureka moment. 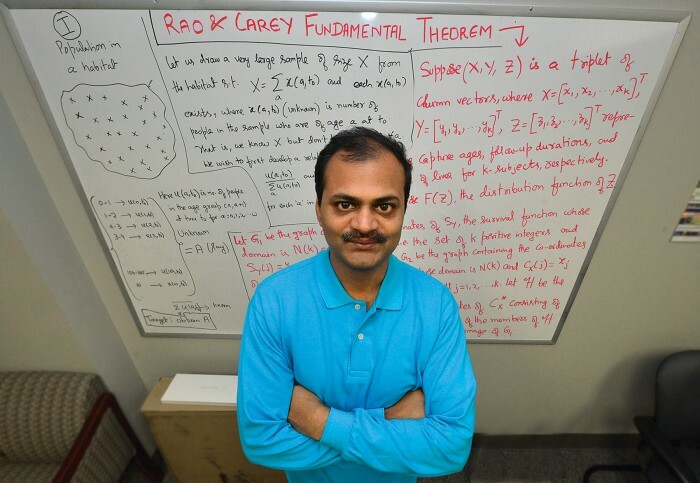 Carey then partnered with Rao, who applied mathematics to make the theorem more readily transferrable to different species. Combining two graphs – one depicting the usual course of individual fruit flies from birth to death and the other charting how long flies live after capture – creates a symmetrical mountain that starts at the peak of one day of life and trails off at the base at about 60 days of life on either side. Genitourinary cancers – prostate, bladder, kidney, testis, and penile cancer – comprise nearly 25 percent of all new cancers diagnosed in the United States. A new study in the journal Cancer appears to be the first assessment of this group’s suicide risk, said Dr. Zachary Klaassen, an MCG urology resident and the study’s corresponding author. The review identified suicide in these patients as a public health dilemma that needs physician awareness, particularly regarding older male patients with aggressive disease. “We have to talk more with our patients about how they are feeling, even if it’s uncomfortable for us,” said Dr. Martha K. Terris, Chief of the MCG Section of Urology, Chief of Urology at the Charlie Norwood Veterans Affairs Medical Center, and the study’s senior author. In a perusal of the National Cancer Institute’s Surveillance, Epidemiology, and End Results Program database, Klaassen and Terris found that bladder cancer patients had a higher suicide risk than patients with other genitourinary cancers. Increased age is associated with increased risk of suicide in general as well as in patients with cancer, note Drs. Marie B. Tobin and Gary D. Steinberg, from the University of Chicago Department of Psychiatry and Behavioral Neuroscience and Section of Urology, respectively, in an accompanying editorial. Higher levels of a “danger” molecule may be one reason males tend to become hypertensive earlier and more severely than females, scientists say. The molecule is HMGB1, which fuels inflammation and high blood pressure. Inside the cell nucleus, HMGB1 helps stabilize DNA. It’s when it escapes that it earns its danger moniker, said Dr. Jennifer C. Sullivan, an MCG pharmacologist and physiologist. Sullivan is Principal Investigator on an American Heart Association grant that will help determine some of the gender differences in hypertension with the goal of improving treatment. In both sexes, it takes some initial stimulus – such as the kidneys over-producing the blood vessel constrictor angiotensin II – to raise blood pressure. The resulting chronic body stress kills a variety of cell types, at which point the cells’ contents, including HMGB1, are spilled into the bloodstream. Sullivan’s research team has early evidence that, at least in rats, males release more HMGB1 than females, likely contributing to a persistent hypertensive response. Additionally, evidence suggests that immune cells, particularly T cells, are important to males’ hypertension development. In fact, male mice missing T cells are resistant to initial stimuli, such as angiotensin II. Liver cells’ mitochondria rapidly splinter when exposed to bile salts that aid digestion, and blocking the process appears to protect the liver, scientists report. The liver uses cholesterol to make bile, which the gastrointestinal tract uses to break down fats. The bile passes from the liver to the gallbladder for storage until needed. When conditions including gallstones or hepatitis push bile back where it came from, the shape of the mitochondria changes. The condition can be lethal. “Basically it destroys the cell,” said Yisang Yoon, an MCG cell physiologist and the corresponding author of a study published in The Journal of Biological Chemistry. 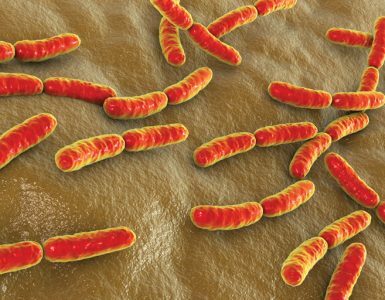 The study links the damaged mitochondria to the bile salt glycochenodeoxycholate. In both cell culture and a mouse model of the condition, blocking the excessive splintering reduced production of reactive oxygen species, a potentially harmful byproduct of metabolism, as well as cell death. 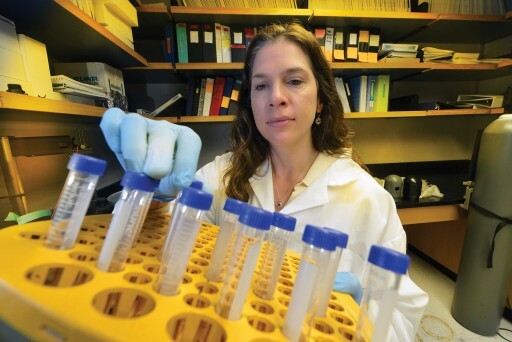 The findings point toward novel cholestasis therapies. A fundame ntal theory about how the thymus educates the immune system appears to be wrong, scientists say. It’s known that stem cells travel from the bone marrow to the thymus gland to differentiate into one of two CD4T cell types: one leads an attack, the other keeps the peace. One widely held concept is that they are exposed to different things in the thymus, said Dr. Leszek Ignatowicz, an MCG immunologist. Those things are ligands, and developing T cells are potentially exposed to thousands of them. 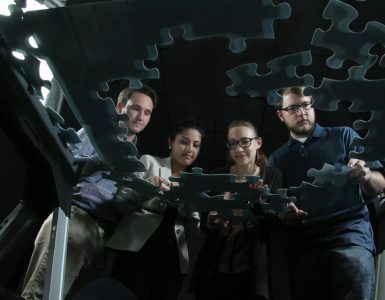 “Ligands are like our fingerprints,” said Dr. Lucasz Wojciech, an MCG postdoctoral fellow. The finding provides more insight into immunity that could one day yield vaccines that steer the thymus to produce more of whatever T cell type a patient needs: more effector cells if they have a bad infection or cancer, more regulatory T cells to battle autoimmune diseases such as arthritis and multiple sclerosis. “We could help steer the education process in the desired direction,” Ignatowicz said. To maximize stroke recovery, researchers may want to focus more on the side of the brain where the injury didn’t occur, scientists report. “Most studies focus on the stroke area and ways to limit damage in that area,” said Dr. Adviye Ergul, an MCG vascular physiologist. However, Ergul and Dr. Susan C. Fagan, a stroke pharmacist at MCG and the University of Georgia, are among a growing number of scientists finding that a stroke can impede the ability of the opposite side of the brain to aid the injured side. That aid includes endothelial cells that line blood vessels on both sides of the brain releasing growth factors – primarily brainderived neurotrophic factor and vascular endothelial growth factor. These growth factors protect neurons, help ailing ones recover, and prompt the growth of new blood vessels to the stroke site, which is screaming for blood and oxygen. All this activity attracts endogenous stem cells, so even if the new blood vessels never carry blood, they help create a regenerative niche that can minimize stroke damage. Fagan, Assistant Dean for the UGA College of Pharmacy campus at GRU and Director of MCG’s Center for Pharmacy and Experimental Therapeutics, and Ergul were the first to report vascular changes in the opposite hemisphere following a stroke. The scientists, who asked the American Heart Association to include a session focusing on the uninjured side of the brain at the International Stroke Conference this year, were the first to report vascular changes in the opposite hemisphere following a stroke. Fagan moderated the session and Ergul presented on vascular changes. A drug that helps keep tumors from growing blood vessels may target a rare genetic condition in which malformed vessels increase the risk for bleeding and anemia. Hereditary hemorrhagic telangiectasia, or HHT, increases the risk of arteriovenous malformations, where arteries feed directly into veins rather than into smaller and smaller blood vessels first, said Dr. James R. Gossage, an MCG pulmonologist. 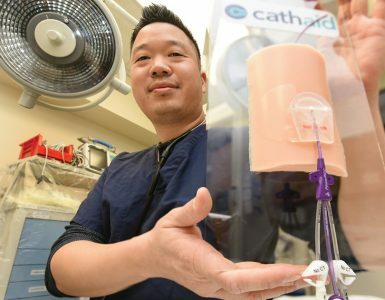 Veins are ill-equipped to handle the increased pressure, so blood vessel size increases along with the risk of rupture and potentially significant bleeding, said Gossage, Director of Pulmonary Vascular Diseases and HHT at GRHealth and Medical Director of the international foundation Cure HHT. GRHealth is one of 17 HHT centers of excellence in the United States. Current therapies include lasering smaller AVMs and inserting coils to obstruct bleeding in larger ones. Drugs such as pazopanib may provide earlier intervention by helping inhibit several mutated growth factors, including vascular endothelial growth factor, which lead to the abnormal blood vessel formation. Mutations in the ACVRL1, ENG, and SMAD4 genes are known to cause HHT. Early laboratory evidence suggests that pazopanib may reduce nosebleeds, anemia, and small AVMs. “We think that proteins such as VEGF are involved with the regulation of vessel formation, and in HHT, blood vessel formation is dysregulated, resulting in AVMs,” Gossage said. Earlier experience with biweekly infusions of the intravenous cancer drug bevacizumab also showed benefit, but Gossage hopes the daily pazopanib tablet will be a more convenient, less expensive, and effective option. In a study funded by GlaxoSmithKline, at least four sites nationally are giving the drug to HHT patients for 12 weeks, then following them for an additional 12 weeks to see if any improvements are sustained. One of the first known oncogenes has a protein partner that helps breast cancer proliferate – and when that protein is blocked, so is the cancer, scientists report. The gene ErbB2, commonly called HER2, is highly expressed in about 25 percent of breast cancers. Scientists have now found the protein Erbin, thought to be an anti-tumor factor, also is highly expressed in these cancers and essential to ErbB2’s support of breast cancer. Blocking the interaction between the two in mice inhibits tumor development and the usual spread to the lungs, according to an international team reporting in the journal PNAS. The team documented the overexpression of both in 171 cases of mostly aggressive human breast cancer as well. The findings point toward a new therapeutic target for aggressive breast cancer and potentially an adjunct for patients who become resistant to Herceptin, or trastuzumab, the drug commonly given to ErbB2-positive patients, said Dr. Lin Mei, corresponding author and Chairman of the Department of Neuroscience and Regenerative Medicine. Additionally, Erbin could be a diagnostic biomarker that physicians look for in breast tissue biopsies, Mei said. Mei and his colleague, Dr. Jean-Paul Borg, Director of the Cancer Research Center of Marseille, both came across Erbin in 2001. Neuroscientist Mei was looking for proteins that regulate the protective covering around nerves, and Borg was looking for cancer-relevant proteins. It turned out Erbin was involved in both. The current international team also includes scientists from China’s Hangzhou Normal University and First Affiliated Hospital and Institute of Life Sciences of Nanchang University. Nicotine’s primary metabolite supports learning and memory by amplifying the action of a primary chemical messenger involved in both, researchers report. “This is the first hint of what the mechanism of the metabolite cotinine might be,” said Dr. Alvin Terry, Chairman of the Department of Pharmacology and Toxicology and corresponding author of the study in The Journal of Pharmacology and Experimental Therapeutics. While the findings show therapeutic promise for a metabolite once thought inactive, cotinine’s benefits don’t hold up across all learning and memory systems, so Terry is looking at analogues that would be even more broadly effective and equally safe. The new findings indicate cotinine makes brain receptors more sensitive to lower levels of the messenger acetylcholine, a hallmark of Alzheimer’s disease, and may boost effectiveness, at least for a time, of existing therapies for Alzheimer’s and possibly other memory and psychiatric disorders. maintain levels of acetylcholine by blocking an enzyme that breaks it down. “This could be an extra boost,” Terry said.